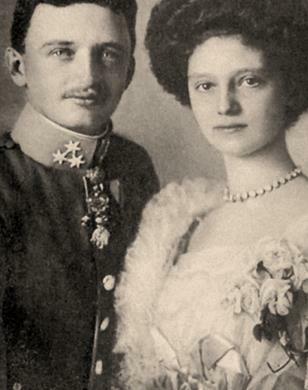 The engagement portrait of Blessed Karl & Zita of the House of Habsburg-Lorraine, who were the last imperial monarchs of Austria. Congratulations on your engagement! The Catholic Church is always delighted when couples find one another and choose to spend their lives together in Holy Matrimony. We hope we can be a part of this important Sacrament in your lives. Still, the Church and the parish have certain policies and guidelines that we want to make you aware of as you plan to celebrate this important day. Therefore, we would like to give certain answers to frequently asked questions. WHAT IS MARRIAGE? Matrimony is the oldest institution in human society. It is a covenant by which a man and a woman establish between themselves a lifelong partnership that benefits one another and that forms a familial relationship for the procreation and raising up of children. The Messiah, Jesus Christ, raised matrimony to the dignity of a sacrament, when it is established between baptized individuals. The Sacrament of Marriage has been viciously under attack in recent years by forces that seek to confuse our notions and undermine this essential institution that makes up the very foundation and building blocks of any stable and healthy society. And so, whereas in generations past, one didn’t have to say something so obvious as 1) marriage is between one man and one woman; and 2) marriage is for life; and 3) young married couples must be open to gift of children, sadly, these days, the obvious is obviously not so obvious. Therefore, our pastor will expect to work with engaged couples to help prepare them for a life-long marriage. WHO CAN GET MARRIED AT OLM? Either the bride or the groom (or both) should be a practicing Catholic in good standing and must be registered at OLM for at least six months, as a general rule. If either party has been married previously, he/she must first seek and be granted an annulment for each previous marriage. Each couple married at OLM will have to have received instruction as part of their preparation for this special Sacrament. Also, we ask Catholics who have not received the Sacrament of Confirmation to do this as part of the preparation for Holy Matrimony. WHAT IF I AM NOT A PARISHIONER OF OLM? The parish will consider hosting the ceremony for non-parishioners, but requests must be made directly to our pastor. You must provide documented evidence that you have had marriage preparation at another parish. Also, we must receive a letter of permission from the pastor of the parish at which you are registered. WHAT IF ONE OF US IS NOT CATHOLIC? Catholics marry non-Catholics all the time, but you must receive a dispensation from the Archdiocese. Talk with the priest about this. Also, if another minister wants to be present for the vow ceremonies here in the Catholic Church, please approach this issue with the priest as well. WHAT ARE THE AVAILABLE TIMES FOR MARRIAGE AT OLM? The ideal time for marriage ceremonies at OLM is Saturday at 11 a.m. Since confessions on Saturday begin at 3:15 p.m. followed by Mass at 4 p.m., the latest time for your wedding would be 1 p.m. If you wish another day and/or time, please discuss this with our pastor as soon as possible. HOW DO I SCHEDULE A WEDDING AT OLM? Parishioners should contact the pastor as soon as they’re engaged, so that the couple might work together with the priest to prepare for their marriage. Nothing can be scheduled without the permission of the pastor. WILL THE PRIEST MARRY US IF WE’RE HAVING OUR CEREMONY IN A WINERY OR ON A MOUNTAIN TOP? Catholic priests are not permitted to marry couples out of doors or at a special event facility. If one of the couple is Protestant and the marriage is taking place at a place of worship, the priest can attend and, with permission from the archbishop, the priest can even preside over the wedding. WHAT ABOUT FLOWERS? Our sanctuary is small, and flowers should be reasonable. Flowers may be delivered at your convenience as long as you have someone present to receive them. If you have flowers you wish placed before the statue of the Virgin Mary and/or St. Joseph, please contact the Parish Office (706-253-3078) so that a proper vase(s) can be made available to you. Nothing can be taped or fixed to the pews, the altar, or the ambo. All flowers must be removed after the ceremony. WHAT ABOUT PHOTOS? Professional photographers must be discrete during the ceremony, and they are not to approach the sanctuary during the Mass. You may have photographs taken one hour before the ceremony. You may have a half hour after the ceremony, depending on your service time, since we have a 4 p.m. Saturday Mass. WHAT ABOUT MUSIC? Happily, OLM has a traditional organ, a grand piano, and wonderful parish musicians who can make themselves available for your wedding, but you must negotiate directly with them for their fees. You may also hire cantors. Contact Bridget Scott, our Director of Liturgical Music, 770-380-1523, smchoirs@yahoo.com, to help you through the process. HOW MUCH DOES THE PARISH CHARGE FOR MARRIAGE PREPARATION AND TO BOOK THE PARISH CHURCH? Marriage preparation is free, but couples will be expected to purchase certain books and materials during the course of their time working with the priest. The parish church is free to parishioners who have been registered and contributing to this parish for at least six months prior to setting their wedding date. For those who are from out of town or another parish, we require a fee of $1500 paid up front. For parishioners and non-parishioners alike, there is an added $100 fee to clean the church. The website of the United States Conference of Catholic Bishops, www.ForYourMarriage.org. This website includes some information about preparing for marriage. The website of the Archdiocese of Atlanta, www.archatl.com; use the Ministries tab, then the Marriage & Family Ministry tab. This site can be useful for planning. SO I THINK I WOULD LIKE TO GET MARRIED AT OLM. NOW WHAT SHOULD I DO? Email Fr. Charles Byrd, the pastor of OLM, at charlesbyrd@ellijay.com. WHAT ABOUT THE USE OF THE PARISH HALL FOR A RECEPTION? Our Parish Hall is one of the most used rooms of our church, so we limit its use to parishioners. Any parishioner who uses it for a wedding reception would need to keep separate the items that belong to the parish from those used at the reception. The room and kitchen would have to be put back together and cleaned by the family themselves. Because there are two Saturday evening Vigil Masses, and confessions begin at 3:15 p.m., any reception in the Hall would have to be cleared up and cleaned out by 2:15 p.m. The Archdiocese requires that you pay a fee for insurance purposes as well. Generally, it may be easier to have a reception at a special events facility somewhere nearby, because those venues will give a family more freedom and options.